Store & Protect MacBook Pro Retina 13"
With an attractive textured dots finish, the blue moon Hard-Shell Case for MacBook Pro Retina 13" from Incase Designs Corp is designed to store and protect your valuable laptop from scratches, dirt, and minor bumps. A well engineered case, it features thermal vents for improved cooling, cutouts for unobstructed access to all ports and functions, and raised rubber feet to help prevent unwanted movement when placed upon smooth surfaces. This case is made of injection-molded polycarbonate plastic for strength, durability, and style. Compatibility MacBook Pro Retina 13"
Box Dimensions (LxWxH) 12.5 x 8.7 x 0.9"
Hard-Shell Case for MacBook Pro Retina 13" (Dots-Blue Moon) is rated 5.0 out of 5 by 8. Rated 5 out of 5 by Kamilla from Mac Shield! Great protection for my new Mac! And it looks great too! Rated 5 out of 5 by David from Nice case InCase makes the best Apple cases! Rated 5 out of 5 by Anonymous from Best for the money I've had an Incase 'shell' on my late 2011 MBP for 5 years; this one is 'harder' that the 'soft' feeling one I have. I think it offers more protection, although it's a little slipperier. Fit is great, easy installation. Rated 5 out of 5 by Anonymous from The best Mac design without the touch bar. Has every connection you need. My first Mac but the switch has been easy and worth it. Love this laptop. No shock issues to date. Rated 5 out of 5 by Tim from Love this! Fit perfectly on my MBP 13.Snap on easy. Rated 5 out of 5 by Melania from Fits great! Nothing fits better than this case! is this cover for macbook pro model A1502? 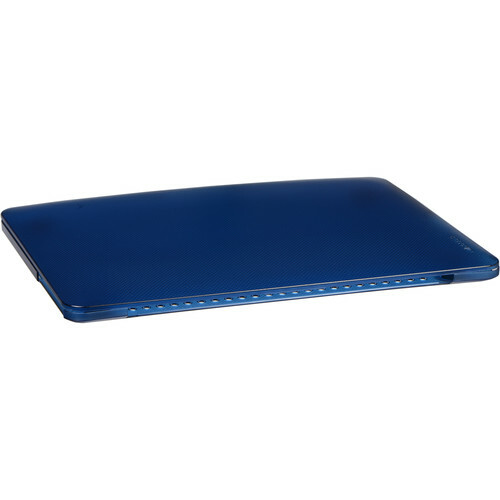 This Incase hardshell will fit the A1502 style case that is used in 2013-2015 13 Retina MacBook Pros. Does This Comes With A Keyboard Cover? no, only the hard cover! does this fit the MBP 13 with Touch Bar, late 2016 model? Unfortunately, it does not fit either of the 2016 13-inch Macbook Pro models. This case will only fit 13-inch MBPs from late 2012 early 2015. To find a case for the 2016 model, look in a product's description for newest model , Touch Bar , 2016 , or something along those lines. The pictures of a case for the 2016 MBP with Touch Bar will also show a computer with two thin USB ports on at least one side (USB-C) or one that is space gray in color, rather than the usual silver aluminum. I hope this helps!